After you returned from a vacation, have you ever let your packed suitcase sit for a few days? I do that all the time. I do it so I can enjoy the lingering fragrance of a foreign country a bit longer. If I just unpacked the suitcase immediately, it would feel as if the journey never happened, right? 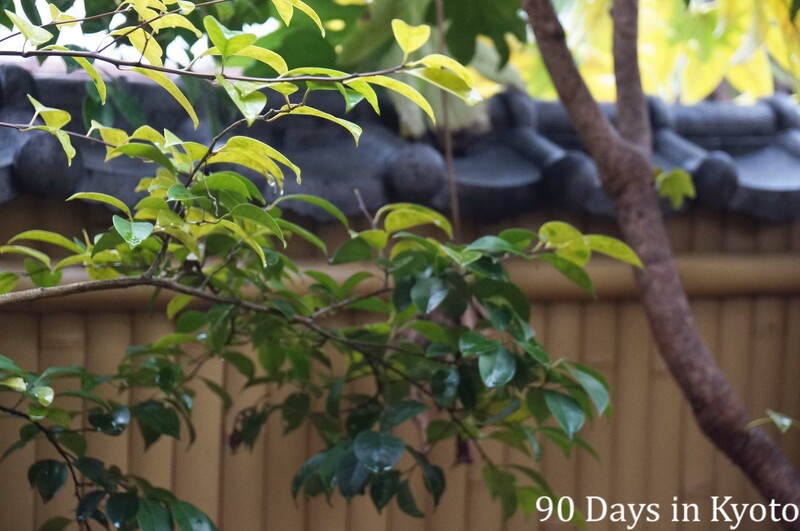 Well, it’s been four weeks since I returned from my 90 days in Japan. I unpacked my suitcase by now, but haven’t touched the more valuable souvenirs yet: the pictures and diaries. Upon my arrival in SF, I decided not to sort my photos or read my notes for a while. I wanted to let all the impressions settle and look at them with a fresh eye when I feel ready for it. So, the time has come and yesterday I finally began to dig through my pictures, put them in different folders and label them correctly with the names of the places I visited. Due to the heavy workload during my training, I had little time to post about all the things I learned and experienced. 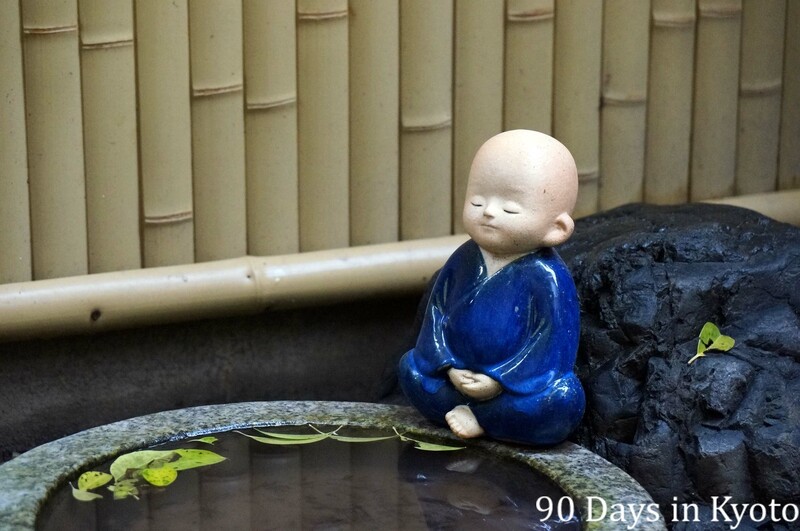 So, from today on, I will post the highlights (and lowlights) of my adventures of a Japanese garden apprenticeship – starting at Day Zero. On Day Zero I arrived at Kansai International Airport late at night and took the taxi shuttle to Kyoto. Using a taxi shuttle is one of the more comfortable ways to get from KIX to Kyoto City, especially with bulky luggage. I stayed at Mamezen, Yonekawa-san’s house and Ramen shop in Kyoto for the first night. I had met him a year earlier via couchsurfing and stayed at Mamezen for 3 nights. Entering the machiya (町家), a traditional Kyoto town house, I immediately felt at home. The space is so relaxing, even iyashi (癒し) – a typical Japanese word meaning comforting, soothing, calming. The word is also often used to describe gardens, spaces (癒し空間) and music, voices. The perfect place to start my adventure, a base camp; a space where I can (and will) come back to when I want to see a friendly face and eat very good & unique Kyoto ramen. I slept very well and rose early the next morning for aisatsu – (挨拶) to present myself to the garden master and everyone in the company. The adventure begins! 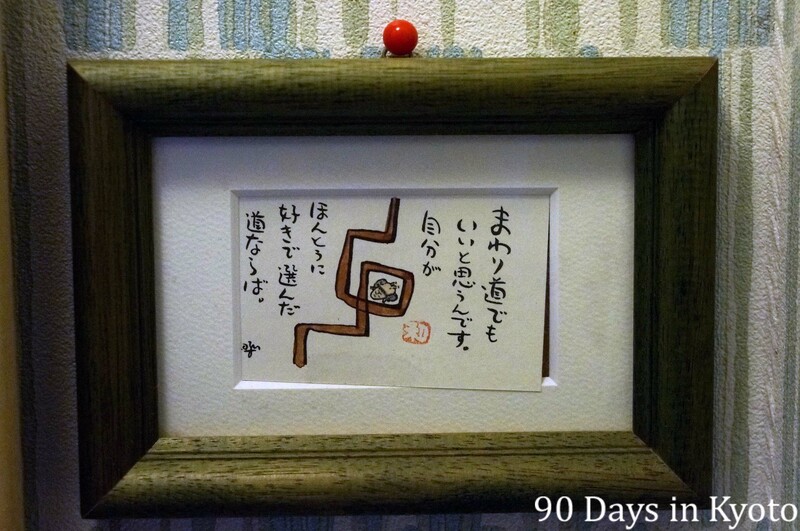 A framed postcard at Mamezen – まわり道でもいいと思うんです。自分がほんとうに好きで選んだ道ならば。Making a detour is good – as long as you chose the way because you liked it.